While the strongest associations that play time recalls are such activities as playing ball, riding bikes or utilizing playground equipment, the truth is that this form of play is not the only component to that of normal child development. Children learn by imagining and doing, and pretend play is a critical part of childhood that assists in the development of cognitive and social skills. All too often, adults turn to technological activities as a replacement for classic hands-on, make-believe play, when the advantages for early pretend play are some of the most beneficial experiences of youth. Pretend play encourages the development for cognitive flexibility, language skills, social skills, problem solving and, of course, creativity. Among these is the opportunity to bond during cooperative play. Kidkraft paid close attention to detail when they designed their vintage-inspired navy blue kitchen. This realistic play kitchen comes with everything little chefs could possibly need to cook up big feats and yummy treats; refrigerator, freezer, microwave, oven, stove, AND the kitchen sink! All doors open and close, the oven knobs really turn, and the sink is removable for easy cleaning. A cordless phone is even included so you can phone your order in to the chef. The attractive navy pairs well with the contrasting white finish handles and silver fixtures. The sturdy wooden construction offers reliable safety for endless hours of playtime fun that encourages a sprinkle of role playing and a dash of imagination! The Hape Gourmet Kitchen presents itself in bold and bright colors that draw the eye and invite you to play. The kitchen's unique and simple design is streamlined for play and opens up a world of endless possibilities for imaginative pretend play. This wooden kitchen invites exploration with fun interactive features such as real working knobs, a towel rack, hutch for storing pots and pans and a preview window on the oven door. Kids will have a blast using their imaginations to cook up tasty pretend meals. This fun creative kitchen in green is a treat when it comes to imaginary and imitative play. Make the most out of play time with the Kidkraft Pink Retro Kitchen and Refrigerator. Aspiring chefs will discover this kitchen comes complete with everything they need to get cooking. Youngsters will find a refrigerator, oven, sink and counter to work their culinary magic on. Doors open and close giving access to storage, the oven door offers a preview window and also opens and closes, and knobs turn and click. The sturdy wood construction handles playtime with ease while the retro pastel design is a fun touch that parents and kids alike will love. This fun design also comes in lavender and blue. Girls and boys will become master chefs in this Cook’s Nook Kitchen from Guidecraft that fits into any playroom and adapts well to corners due to its L-shape design. Kids will love the appealing pop of red accenting the kitchen's colorful palette. 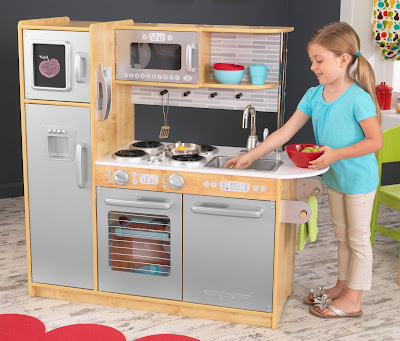 Styled like a real kitchen, this wooden play set is equipped with microwave, a refrigerator and freezer, an oven and a stove with clicking knobs, a sink with a faucet and a towel rack. Upper and lower shelves and cabinets offer plenty of storage for play food, dishes, and appliances. Serve your guests via the serving window with decorative awning and announce today's special with exterior chalkboard. A write-on/wipe-off board on the side offers endless opportunities to be creative. A Kid Place knows the value of pretend play and boasts an inventory that reflects this. Our online emporium is stocked with an endless variety of toys, themed furnishings, educational toys, and more. You'll find we have the best toys for children’s make-believe play!